Stampin' Anne: The Holiday Mini is HERE! There are SO many reasons to love the fall season and today, Stampin' Up has two more to add to that list! First of all, the exciting NEW Holiday Mini Catalog is LIVE today! Woot Woot! Get ready for some fun and fabulous new products and project ideas. -See an idea you like? Click HERE to view the supply list from this catalog. -Want to hold a copy of this new catalog in your own hands? Contact me today to get your printed copy. -Please be sure to check out some fun, new FALL project ideas on my side-bar, many of the items used are found in the new Holiday Mini Catalog. The second thing I have to tell you about is a new and exciting promotion Stampin' Up just launched today! -Would you like one of your very own? 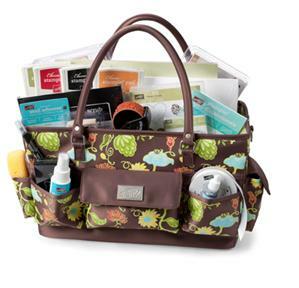 From September 1st through October 18th (or while supplies last), you can receive this awesome craft tote FREE (a $39.95 value) when you join me as a Stampin' Up Demonstrator!